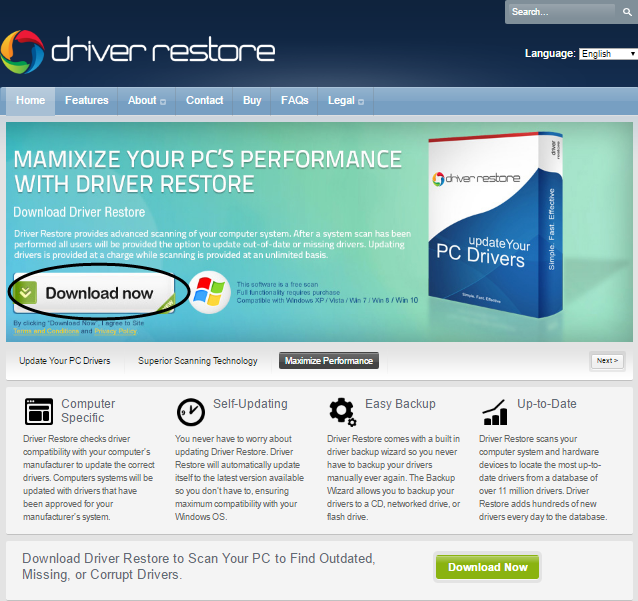 How to download & use Driver Restore? 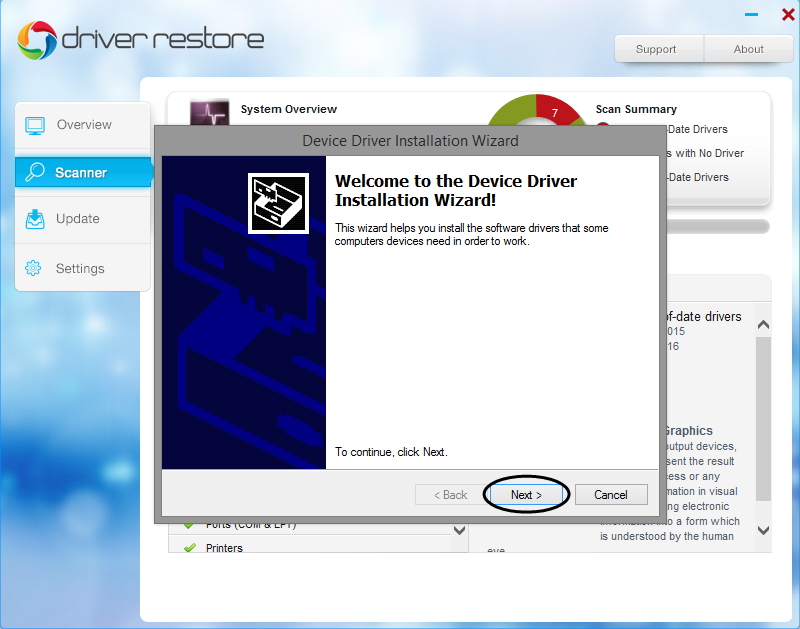 This user guide offers you more detailed information on ‘How to use Driver Restore’ step by step. Please follow the instructions given below. Click on ‘Download Now’ to download as indicated below. 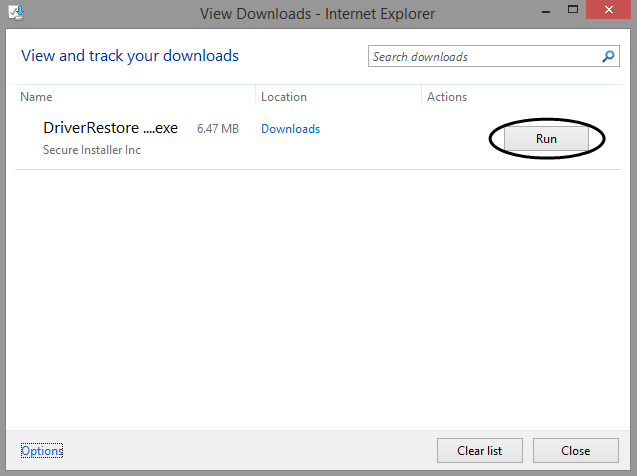 In the prompt window, click ‘Run’ to download Driver Restore. * For Chrome and Firefox users ‘Save File’ tab appears. Click on ‘Save file’ and the file will start to download. You can view it in the download folder. Wait until the downloading process is finished. 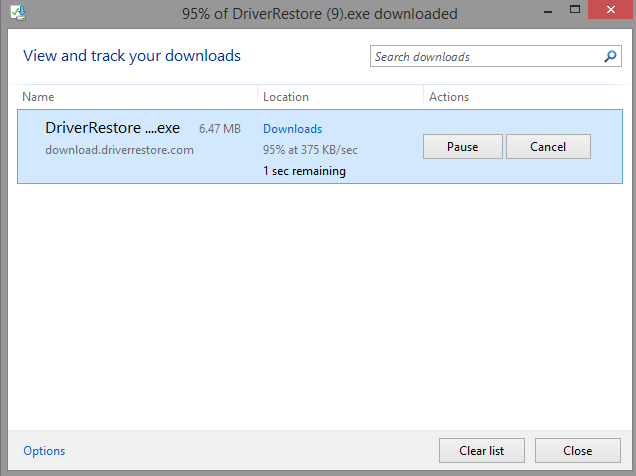 When the downloading process is completed, click on the downloaded file to show UAC (User Account Control) prompt asking for user’s permission to install Driver Restore. 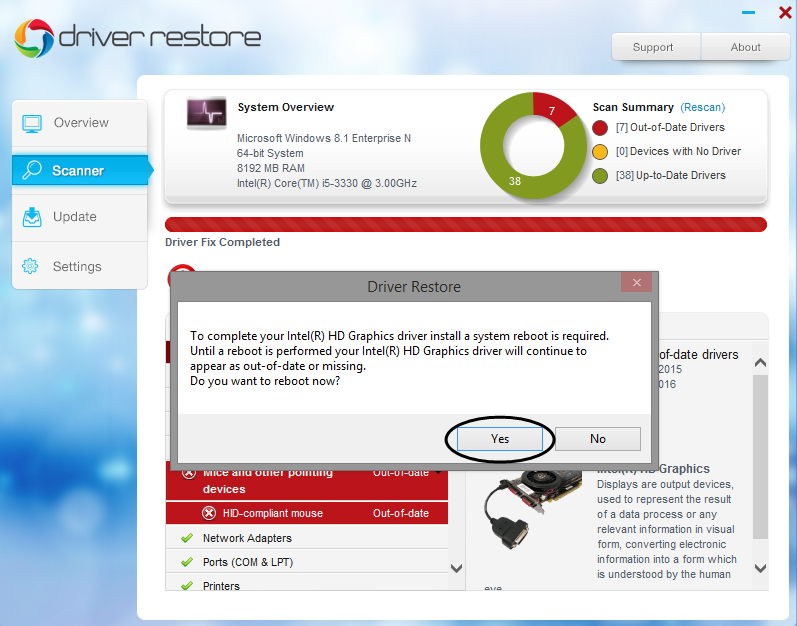 Click on ‘Yes’ to continue. 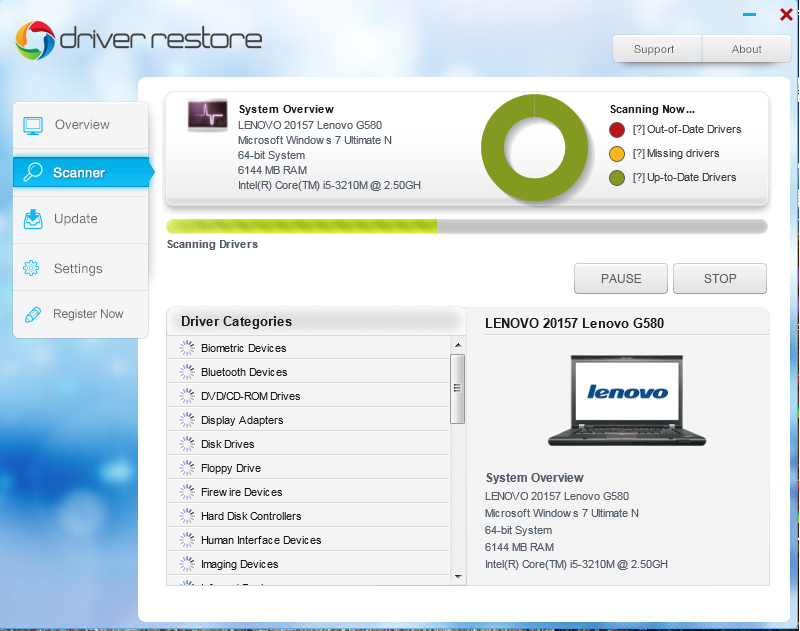 Driver Restore will start scan. 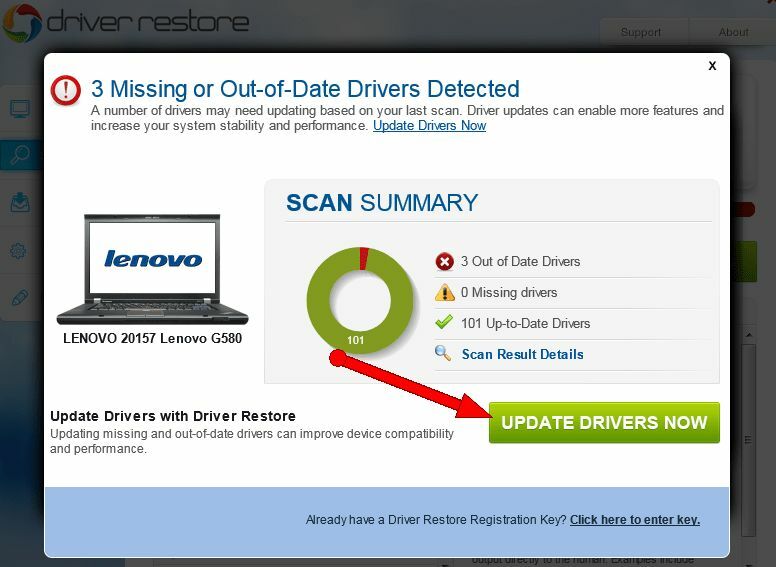 After the scanning process is completed a pop up window will appear showing the number of outdated drivers that need to be updated. 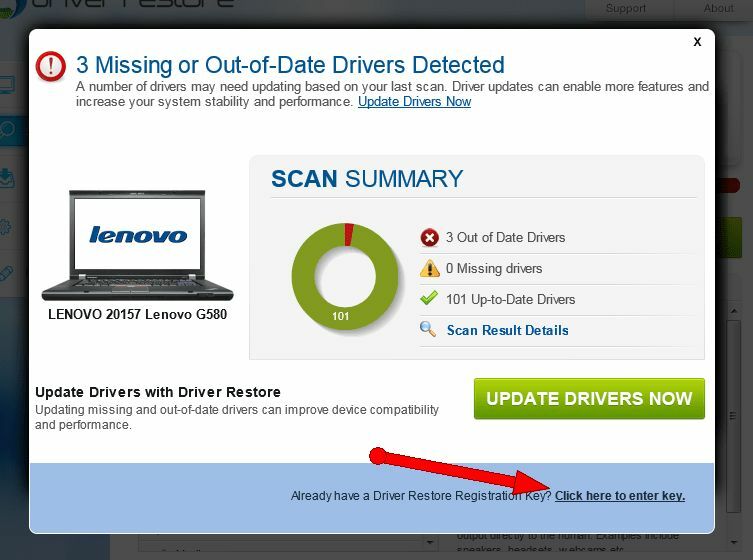 You will be provided with two options in the same window i.e Update Drivers Now, for all those who don’t have registration key must click on the same. 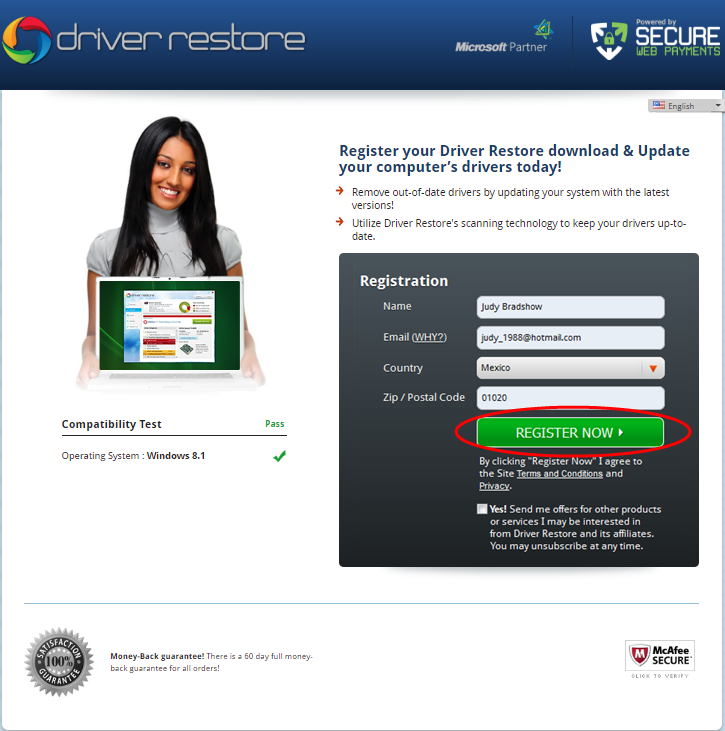 By clicking on ‘Update Drivers Now’ tab a user will be redirected to the cart page, from where they can buy the Registration Key to get the drivers updated. * And those who have purchased the registration key should click on ‘Click here to enter key’ shown at the bottom of the prompt window. 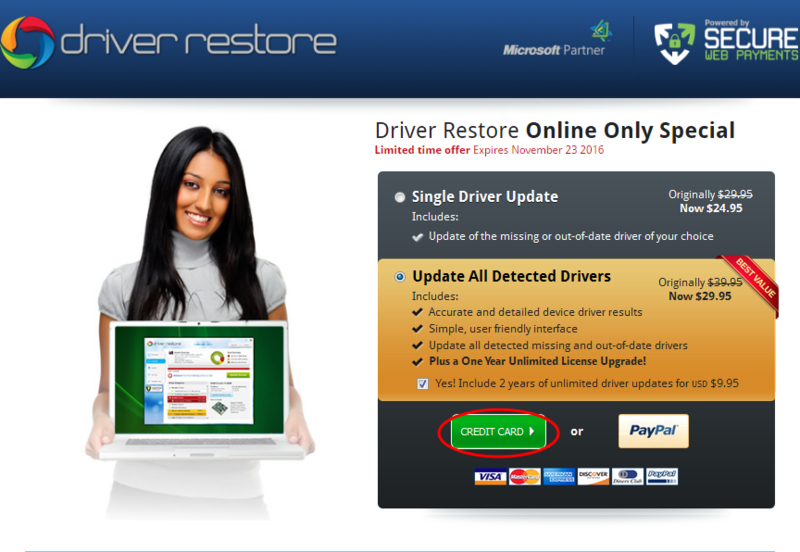 To buy Driver Restore, you can directly go to the ‘Buy’ page on our website www.driverrestore.com/buy or you can move further after the scanning process is complete by clicking on ‘Update Drivers Now’. Please fill all the details carefully. After filling up the required details click on ‘Register Now’ button. After clicking on ‘Register Now’ tab you will be redirected to the next page to make the payment either by Credit Card or Paypal. 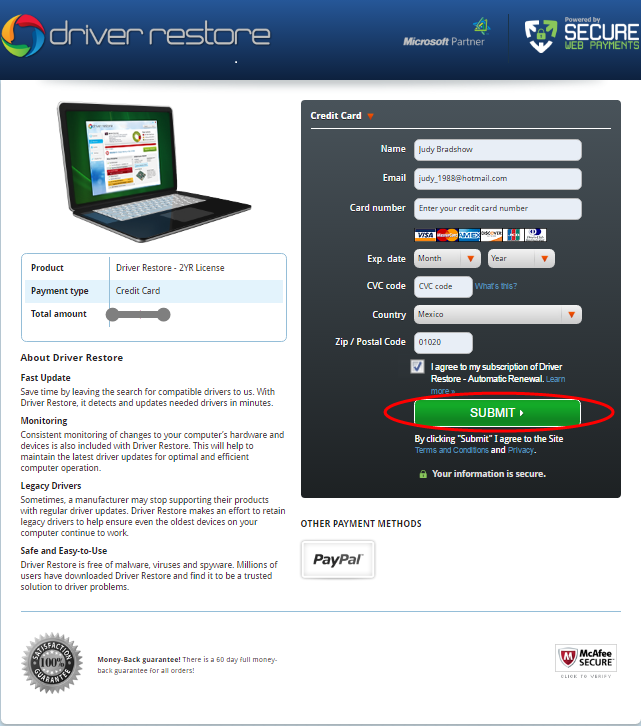 Please fill your details carefully and click on the ‘Submit’ button. 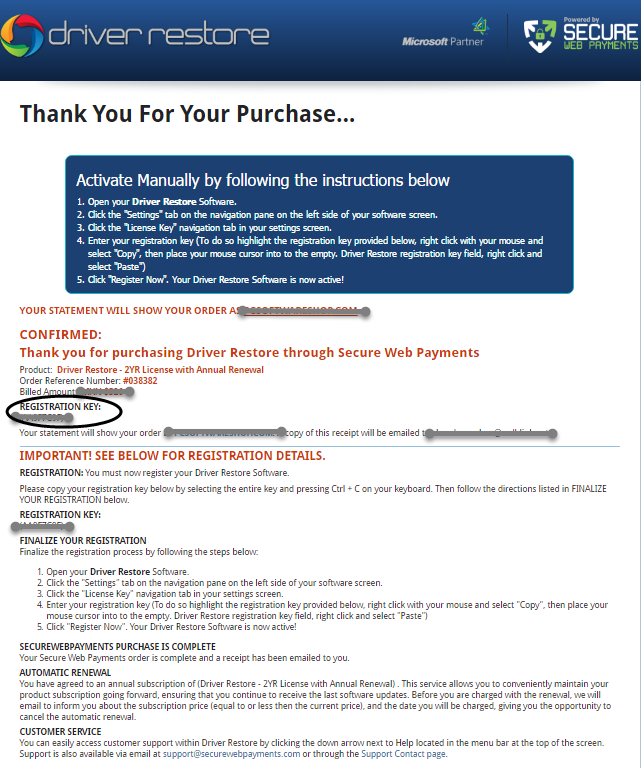 You can view the order confirmation page with the registration key and order total. 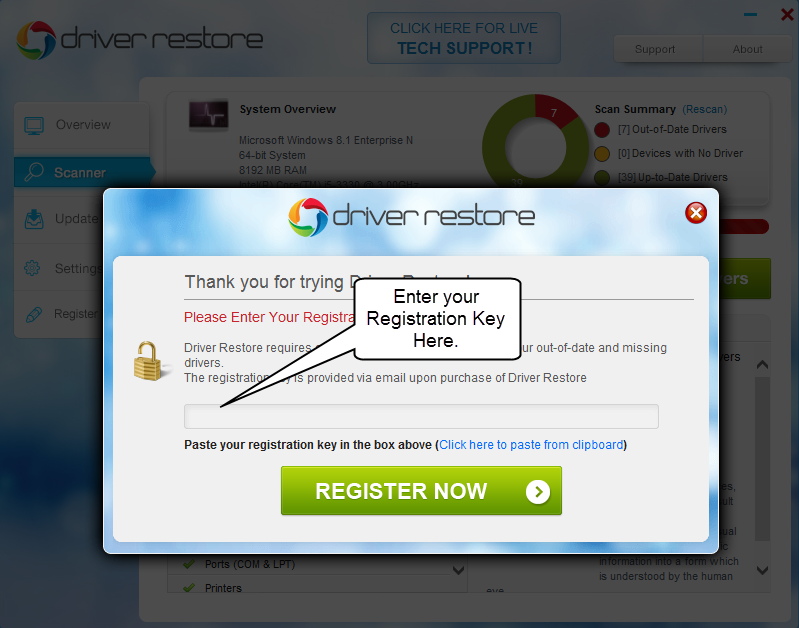 Enter your Registration key in the box provided and click on ‘Register Now’ tab. 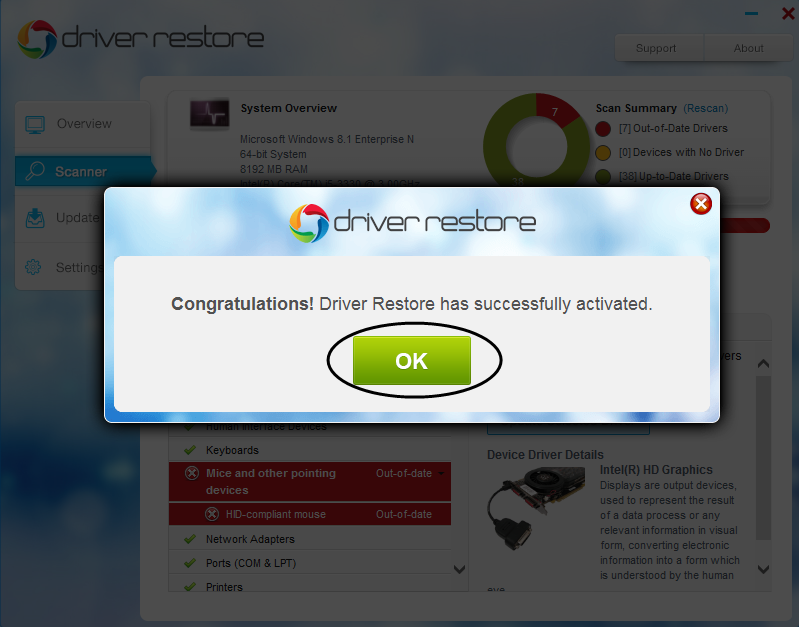 By clicking on ‘OK’ button you are ready to use Driver Restore. 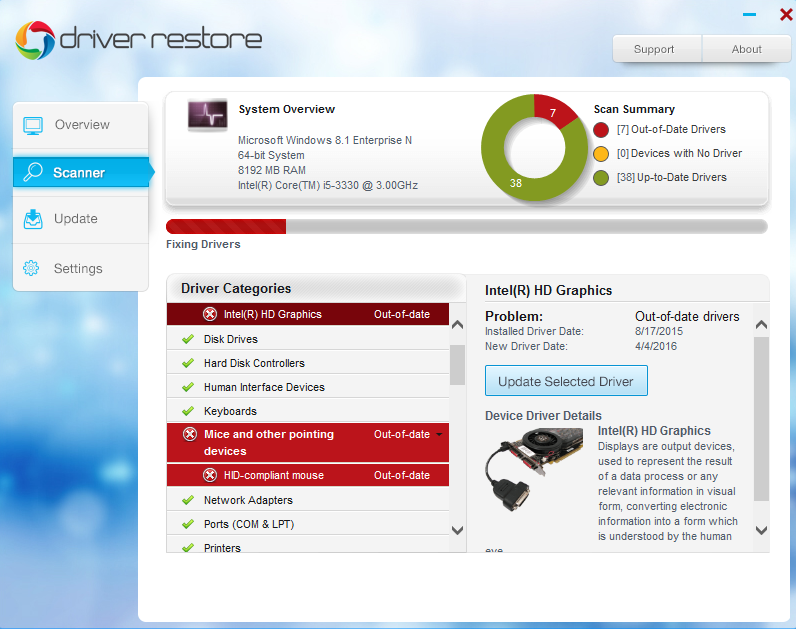 You can select the outdated drivers one by one and click on ‘Update Selected Driver’. 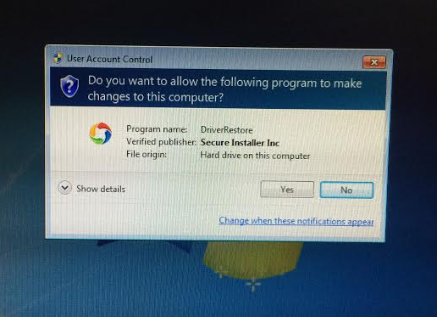 As soon as the download completes, it will ask for user’s permission to continue with the installation. 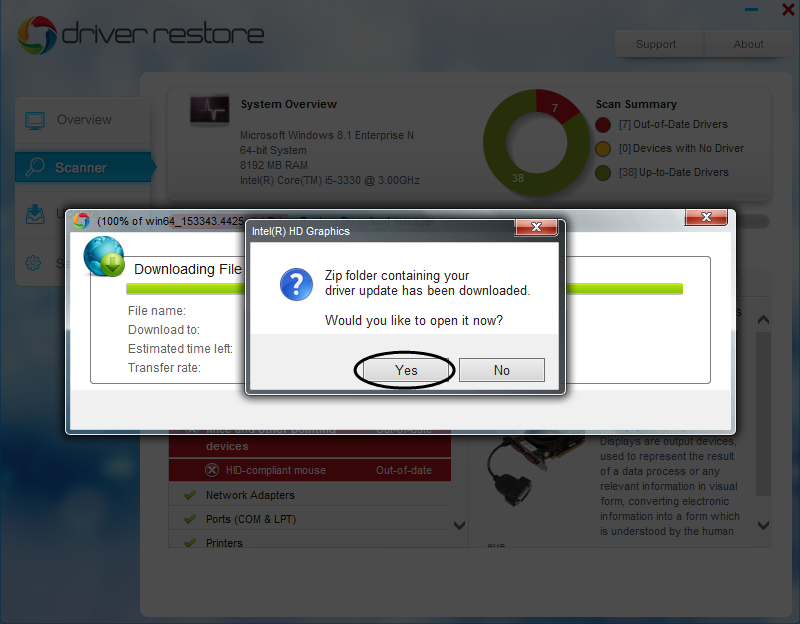 Click on ‘Yes’ to continue. A popup window will appear on your screen. You just need to complete the setup by clicking on ‘Next’ button. 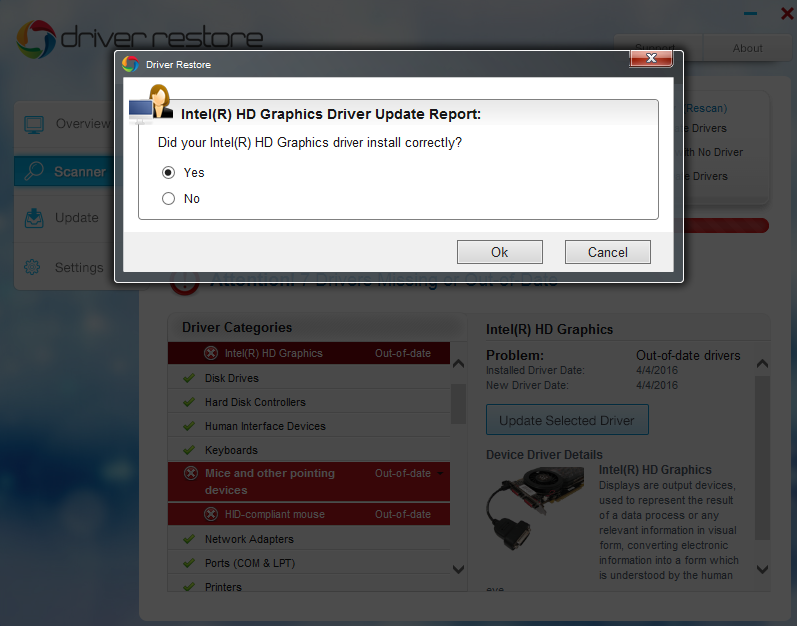 After successful installation of driver setup it will show a popup asking for the system reboot. Click on ‘Yes’ button to continue. * We ask for the reboot for the proper functionality of the driver installed. Here’s the feedback form asking for user’s review.